April showers to end the month, then a beautiful start to May! We've experienced a cool, breezy day today with high cloudiness covering the region. The clouds and breeze can be traced to the atmosphere battling between high pressure to our north over the Plains and Midwest and low pressure to our south from old Mexico into the Gulf Coast region. Despite the last few days of cooler weather, the month of April is about 3 degrees above normal temperature-wise. High pressure to our north and multiple areas of low pressure to our south mean cloud cover and a northeast breeze in the Mid-South as the storm track stays to our south into this evening. The string of low pressure systems has been responsible for severe weather from TX to LA last night into this early afternoon. Below is a graphic that shows lightning density (number of strokes per square kilometer) from 1:30am-1:30pm today. It's easy to pick out the storm track! Lightning density plotted between 1:30am-1:30pm CDT today (cumulative) clearly show where storms have occurred in the past 12 hours or so. Image courtesy WxBell. 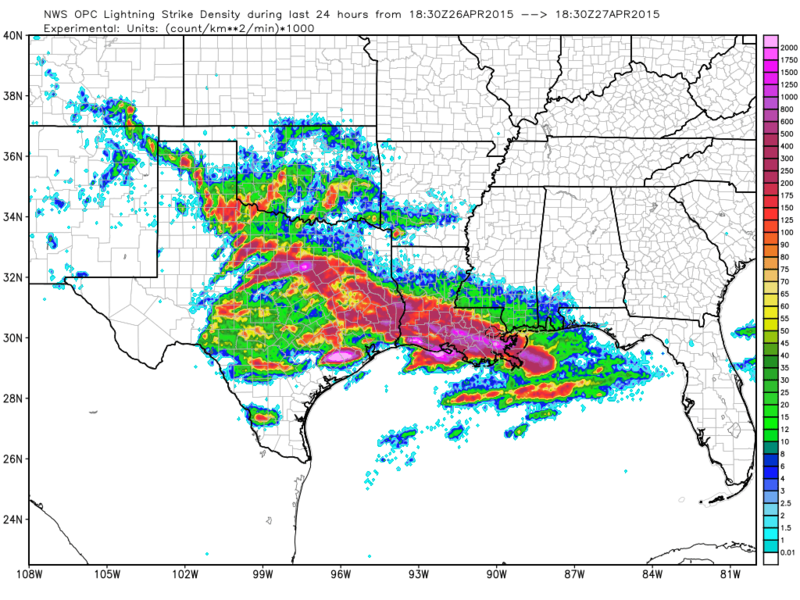 The storms in Texas last night dropped tornadoes and softball size hail. By mid-day today, the same system was responsible for torrential rain, copious lightning, and extreme wind (strong enough to blow several empty train cars from a rail bridge in New Orleans, watch the amazing video from WGNO-TV below). As the main area of low pressure moves across the Gulf Coast over the next 48 hours, our cloudiness will turn into periods of showers as we head into Tuesday, with lingering clouds and possibly light rain or drizzle on Wednesday. This will help reduce our rainfall deficit for the month of April a bit as we head into May. Temperatures will stay below normal through mid-week thanks to the clouds and rain. Total precip expected by the GFS (American) computer model through Wednesday evening as low pressure tracks to our south. Most areas in the metro are forecast to receive about 1/2" of rain with the Tuesday/Wednesday system. However, as we head towards week's end and the first weekend in May, we'll return to more seasonal weather with afternoon temperatures slowly climbing back towards 80° though mornings will remain pleasantly cool as humidity values stay fairly low. 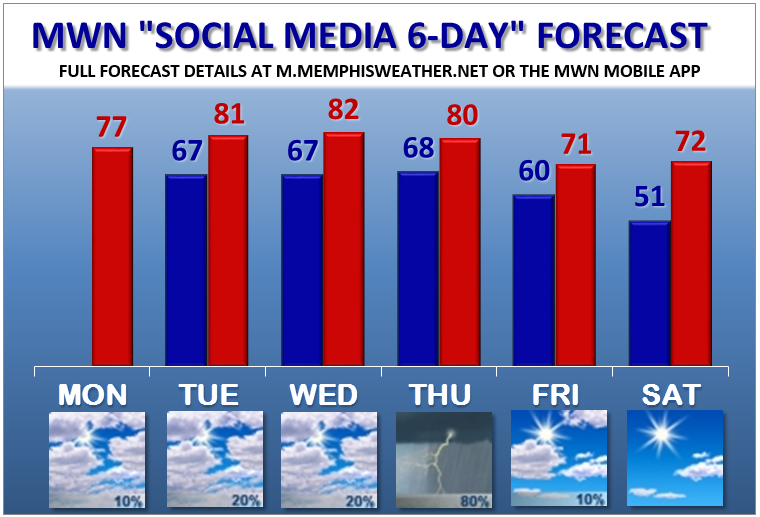 In addition to pleasant temps, sunshine will be ABUNDANT for the kickoff of Memphis in May and Beale Street Music Fest! 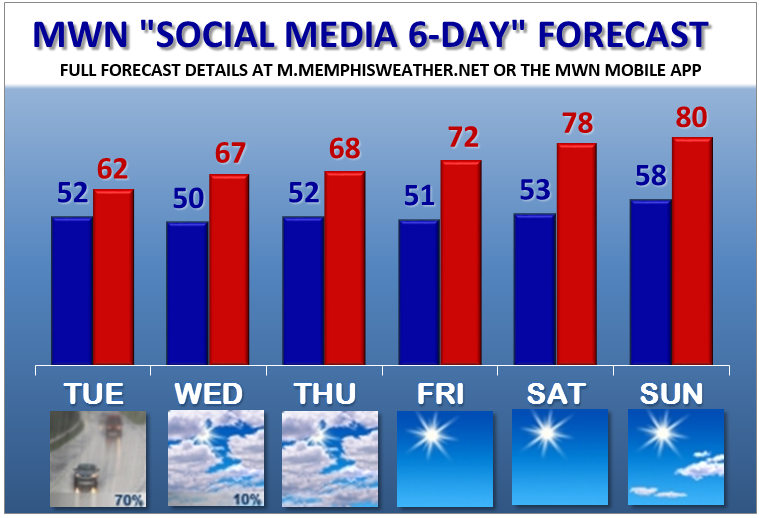 At least for this weekend, it won't be "Memphis in Mud" and the biggest concern will be possible sunburn prior to dusk! As we head towards a busy late April weekend with plenty of outdoor activities to choose from, weather may play a role in the outcome of some of them. I'll cover the expectations and potential hazards for the next few days as another developing Plains low moves east through the Mid-Mississippi Valley. The low takes shape and begins to strengthen in western Kansas as high pressure now to our north shifts east off the Atlantic seaboard and a warm front starts slowly moving north from the Gulf Coast. Showers become increasingly likely during the day in the Mid-South as moisture overrides the warm front with very low chances of thunder. Rainfall should not be excessive during the day but chances increase from a low probability in the morning to higher probabilities (likely in fact) by late in the afternoon. Temperatures should reach 70 by afternoon. Friday evening (7pm) surface map shows a warm front lifting north towards the Mid-South as rain falls ahead of it (dark green). Map courtesy NOAA/NWS. This will be the wettest period of the forecast as the warm front lifts through the Mid-South and the low continues shifting east. Periods of heavy rain are possible and thunderstorms are expected. Rainfall could reach an inch during the overnight in some places within the metro. It will also remain mild with temps in the 60s and a gusty south wind. Saturday morning (7am) surface map with the low moving east across MO, a warm front to our north, and rain chances dwindling. Map courtesy NOAA/NWS. While the severe weather threat is low Friday night, it is not nil. Most of the metro, as of mid-day Thursday, is in a Slight Risk zone (category 2 of 5), with the best chances of severe storms to our west. Some storms may be capable of producing strong wind gusts or hail. This forecast bears watching but overall I'm not impressed with the chance of significant hazards or damaging weather. If you plan to be out Friday night, keep an eye on your favorite weather source. Friday's severe weather outlook from SPC shows the best chance of severe storms to our west with a Marginal to Slight Risk during the overnight hours in the metro. By early Saturday morning, most of the rain should be east of the metro from Friday night. The low pressure system will be scooting by to our north and most models give us a fairly dry day with some sunshine, especially in the afternoon, very gusty southwest wind (to 30+ mph), and temperatures that soar into the 80s! The key words above are fairly dry, as there will be some impressive ingredients in place for severe storms capable of producing hail and strong wind, as well as a very low tornado threat. The last remaining ingredients seem to be a trigger to get those storms to form (which should be a cold front that sweeps through the area) and additional moisture in the low levels that looks to be less-than-optimal for storms. Thus, while the precipitation chance is low (30% at this writing), any storms that manage to fire could get strong quickly. The best chance of storms forming appears to be around lunchtime through the mid-afternoon hours and locations to our east probably have a better chance of severe storms than here in the metro. 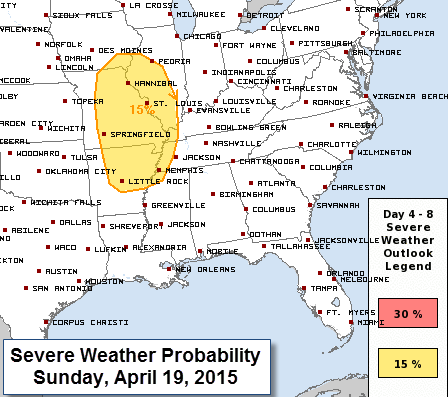 Saturday's severe weather outlook from SPC indicating a chance that any storms that form could become severe. If you plan on being out on Saturday, the weather factors to consider are: protection from the sun with temps in the mid 80s, a very strong southwest wind, and the possibility of a few strong to severe storms forming. 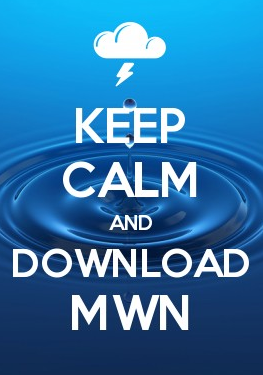 Keep one eye to the sky and follow us on Twitter or the MWN mobile app for the latest updates. With one weather-maker in the form of low pressure and a trough having departed this morning, we now focus our eyes to the west where our next chance of rain will arrive from later today. Temperatures should easily make it to the mid 70's with help from peaks of sunshine. That energy will help fuel storms later this afternoon and evening along an approaching cold front. Lets take a closer look at what to expect from storms. The Storm Prediction Center outlook from 11:30 AM has the entire metro in an Enhanced Risk zone (3 out of 5). The expected threats from this evening's severe weather are mainly straight-line wind above 60 mph (a 30% chance of this occurring within 25 miles of you) and large hail (a 15% chance), though an isolated tornado is also possible (5% chance within 25 miles). Lets shift toward the most likely timing of the event. 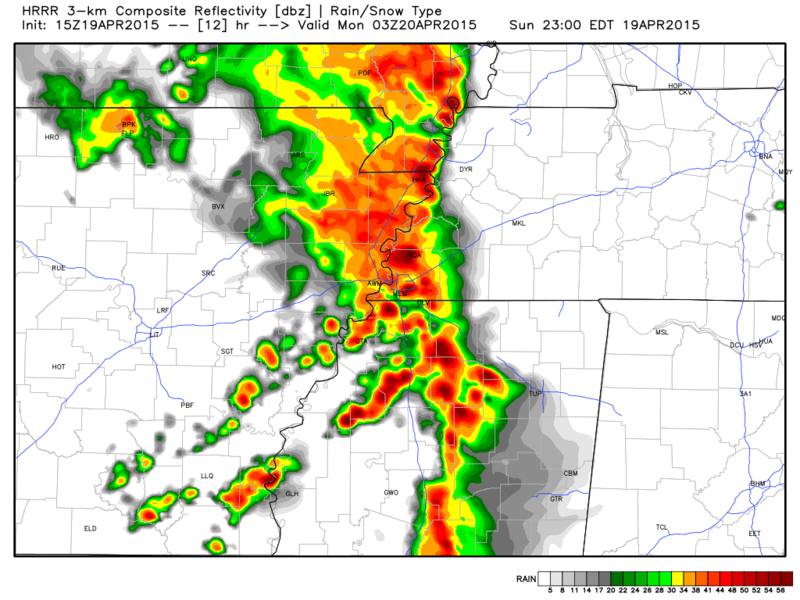 HRRR model simulated radar valid at 10pm, showing the main storms over the metro. Graphic courtesy WxBell. The latest data from our short term, high resolution weather model (the HRRR, above) shows the main line of thunderstorms across the metro at 10 PM tonight. While this is not an exact forecast (it is just one model run among many), it still gives us an idea of approximate arrival of the line of potentially severe storms. Often times frontal systems will be a little bit faster than the model predicts, so it would not be surprising if we saw this set-up an hour earlier. Additionally there is a chance of a few showers this afternoon and a strong isolated storm or two could get going prior to the arrival of the squall line itself (late this afternoon and evening), though that scenario doesn't appear to be as likely as the early afternoon shower chance. Enjoy the afternoon, but be prepared for scattered showers and thunderstorms by early evening, with the arrival of the main line of storms between 8-11 PM. For those of you headed to the first Grizzles playoff game, be prepared for severe weather to be coming in right around the end of the game and remain weather aware as you depart. As always, make sure you have multiple sources for warning information and plan accordingly. While this is not expected to be a significant severe weather outbreak, it only takes one severe storm for you to be impacted. We recommend StormWatch+ within the MemphisWeather.net app as one means of receiving precise warnings for your specific location and stay tuned to our social media channels for the latest throughout the day. Yesterday's blog post contained an initial look at the weekend weather pattern. Feel free to check that out for the overall pattern. Today we fine tune and give you some information you can plan your weekend activities around! As morning rain and thunderstorms diminish this afternoon, we should be looking at a dry evening and overnight across the Mid-South. Weak high pressure aloft builds in behind this morning's upper-level energy pocket that brought rain to north MS and some flooding to far eastern AR, just west of the metro. The daytime hours on Saturday look a bit better than they did yesterday. In fact, the morning should be dry and scattered showers may not start affecting the region until well into the afternoon. Garage salers, ball players (and fans), and yard mowers should get several hours to get their activities in to start the day! Temperatures will probably get close to 80° in the afternoon. On Saturday night, we'll see low pressure move north across north MS and west TN. Showers and a few thunderstorms will be in the area probably by dinner time and steady rain is likely overnight. Fortunately, this high chance of rain will probably not have a big effect on outdoor plans, other than perhaps Saturday evening. On Sunday, we'll again be between systems as the low departs to our north and a frontal system begins tracking towards the area from the west. However, there will be some instability over the area, which may mean scattered showers or thunderstorms during the day Sunday as temps hit the mid 70s. Models still disagree on just how much rain we could see, but for now, have a backup plan for anything you plan outdoors during the day. 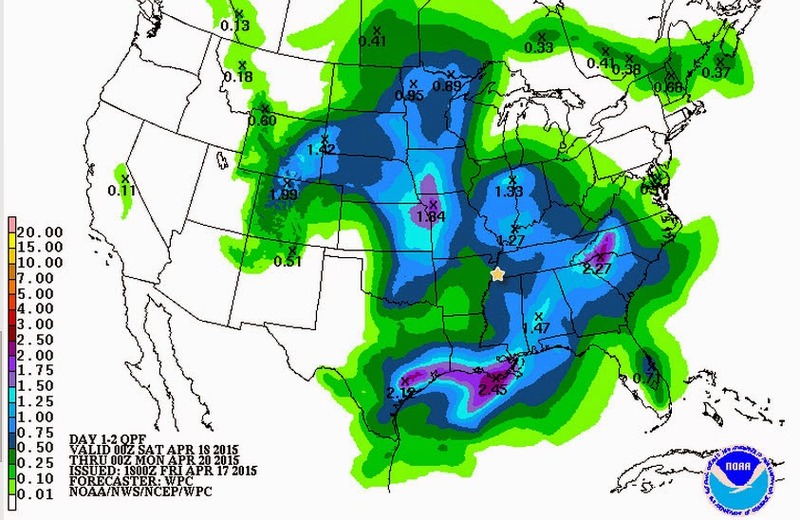 Total precipitation as forecast by NOAA through Sunday at 7pm. These amounts are down a bit from earlier forecasts calling for possible flash flooding, though saturated ground may still result in excessive runoff. By Sunday late afternoon into the evening, you'll need to keep a close eye on the front moving across AR. The Storm Prediction Center has placed a large part of AR in an Enhanced Risk of severe weather (category 3 of 5) and west TN and north MS in a Slight Risk (category 2 of 5). We'll be watching for you as well. 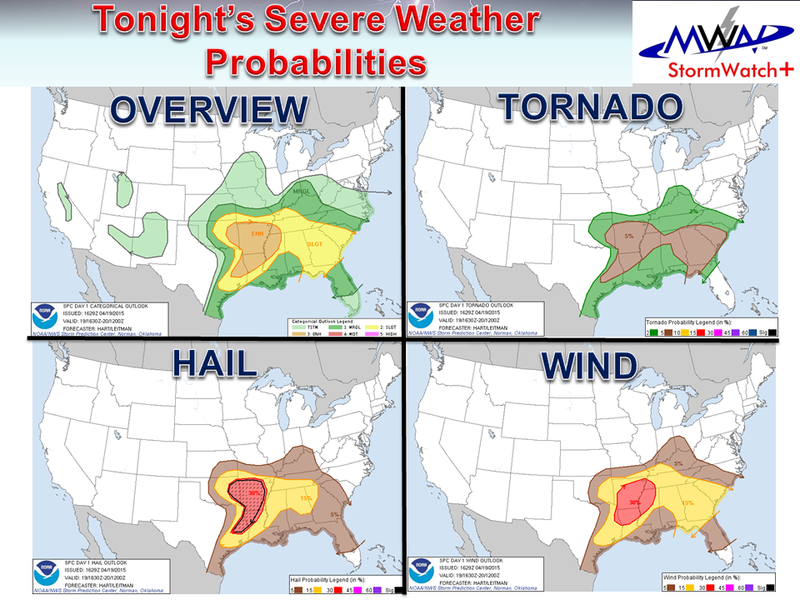 The outlook shown below will be updated a few times prior to the event unfolding, but it looks at this time like we'll see strong to severe storms in AR, capable of hail, strong wind, or a tornado, move across the metro during the evening hours. As it gets closer, the storms should form a squall line, transitioning the main hazardous weather types to a mainly damaging wind event, though large hail could be possible as well. For now, we recommend you keep up to date with multiple sources of weather information. There is a high likelihood that any outdoor plans Sunday evening will have to be moved indoors or postponed. We'll have a better idea of timing and how the storms will evolve as we get closer to the event. As they say, "STAY TUNED!" We also recommend you download the MemphisWeather.net mobile app (linked below) for our latest forecasts and radar updates and consider StormWatch+ within the app for your severe weather alerts. Things look to improve dramatically by the start of the work week with seasonal spring temperatures and dry weather early next week. A nice day overall today as weak high pressure built in behind scattered thunderstorms last evening! Highs have reached 80 at most locations with a partly cloudy to mostly sunny sky. 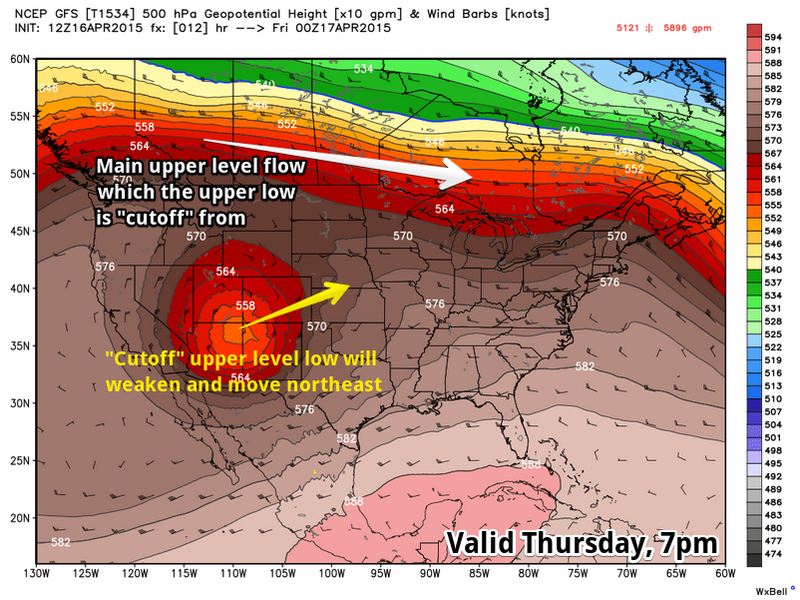 However, the large upper level system that we talked about early this week that would keep things unsettled this week still lingers to our west, meaning wet weather is not over just yet! The main upper level system is still well to our west, which means we'll deal with an unsettled pattern until it moves past us. It is forecast to be "absorbed" into the main upper level flow by this weekend. Graphic courtesy WxBell. We'll likely see some more foggy areas in the morning, or at least low clouds, as moist ground and light south wind combine with cooling temperatures to push humidity levels above 90% and promote low clouds and fog. Another impulse from this big storm system will move through the area tomorrow as well, bringing a chance of showers and thunderstorms, mainly during the afternoon hours, though some model data is hinting at a bit of development early tomorrow morning as well. 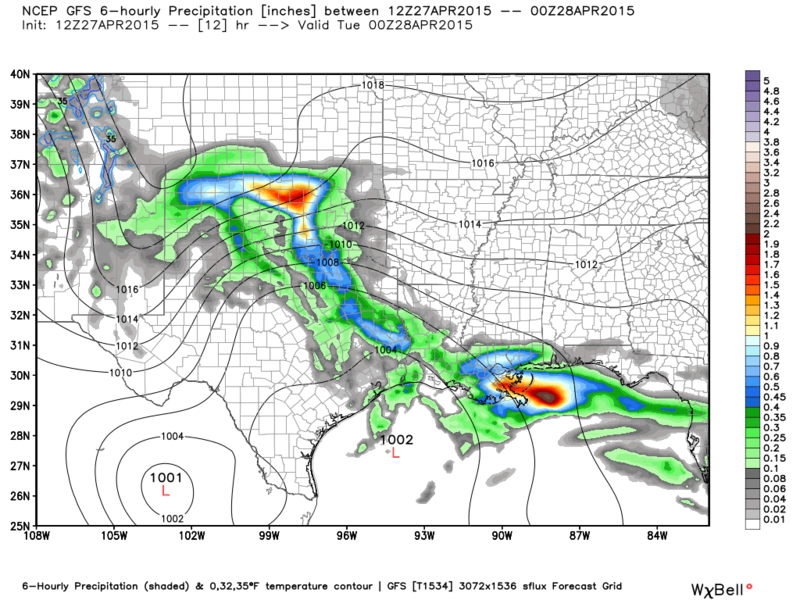 The GFS model indicates scattered precipitation, likely a few t'storms, will be around tomorrow afternoon. 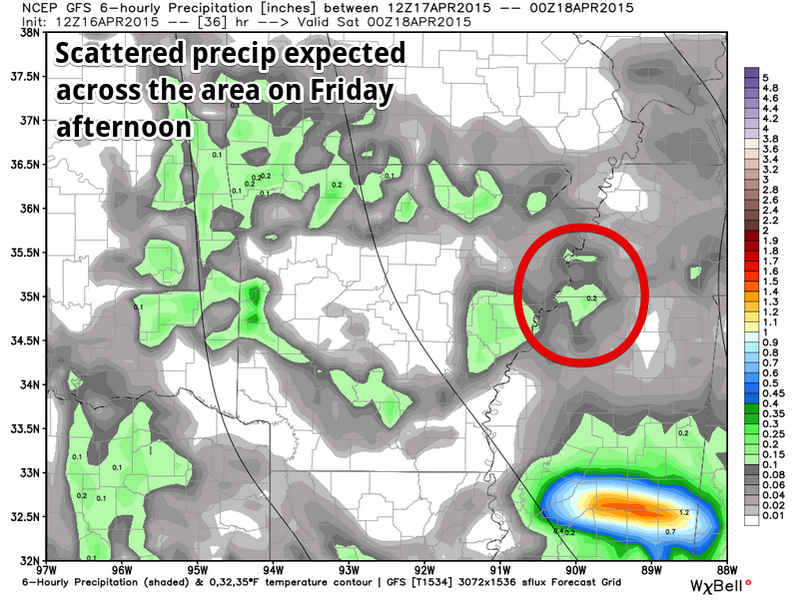 Shown above is possible precipitation totals between 1-7pm Friday. Graphic courtesy WxBell. The best chance of rain arrives Saturday however with heavy rain possible from late Saturday afternoon through Saturday evening. With high moisture content in the atmosphere and a potent weather-maker moving through, widespread rainfall totals of 1-2" look likely and some areas might see higher amounts. With recent rain and saturated ground, much of the water from this system could run off, resulting in full streams and creeks, high tributary levels (rivers that flow into the Mississippi), and possibly flash flooding. If you have outdoor plans Saturday, the sooner the better! 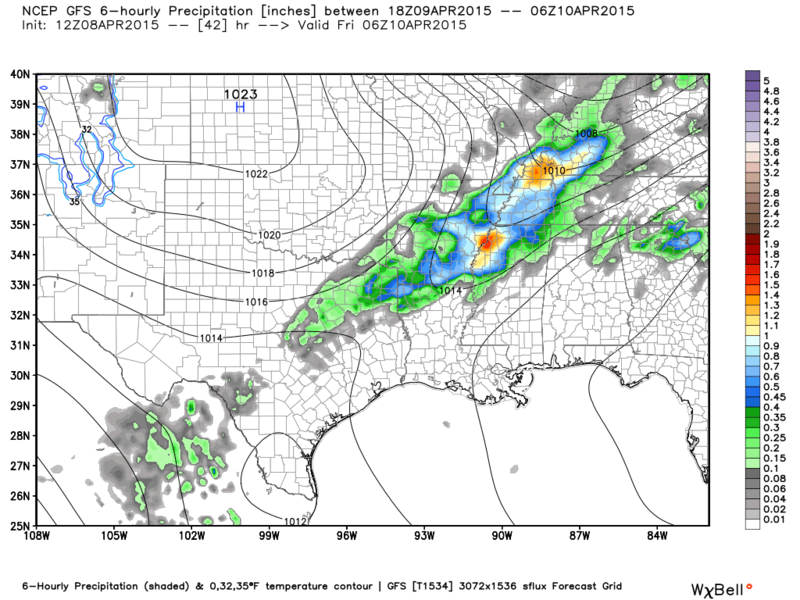 Models still disagree on when the rain arrives, but the later it gets, the higher the chances. 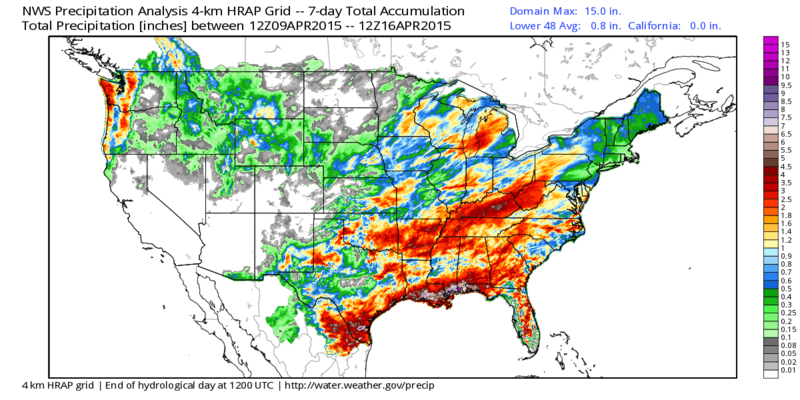 NWS precipitation analysis for the past 7 days, showing total rainfall amounts. 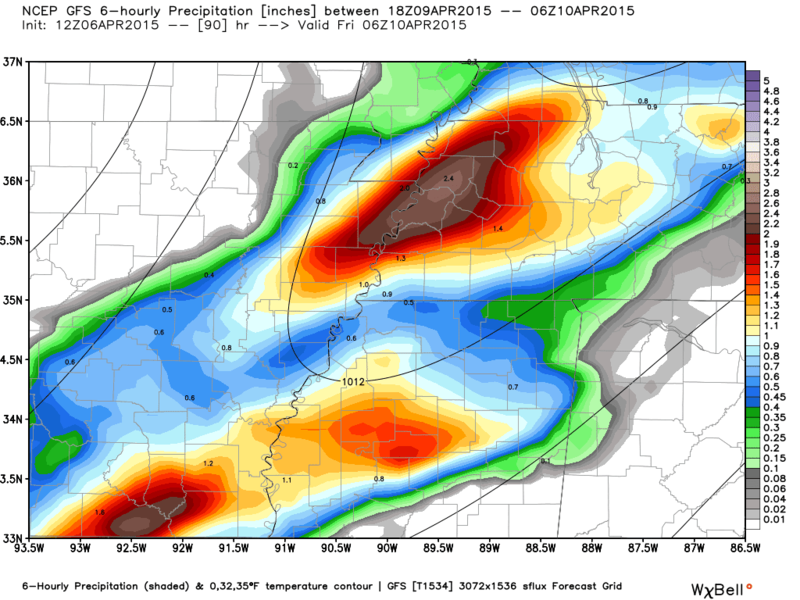 A swath of widespread 2-3" totals is easy to pick out across the Mid-South into the Ohio Valley. Additional rainfall will likely result in runoff. Graphic courtesy WxBell. Forecast rainfall amounts from the NWS through Sunday morning. Widespread 1-2" amounts will be common. Once that system moves out Saturday night, the main low pressure center responsible for the unsettled pattern will eject out of the Plains and move by to our north on Sunday. It will drag a cold front through the region that has the potential to bring some strong storms on Sunday afternoon and evening. The Storm Prediction Center is watching our the region roughly from Memphis north and west into AR and MO for this possibility. They currently give us a 15% chance of seeing severe weather within 25 miles. This roughly equates to a Slight Risk of severe weather (category 2 of 5), though that term is only used out to 3 days (Sunday is day 4). 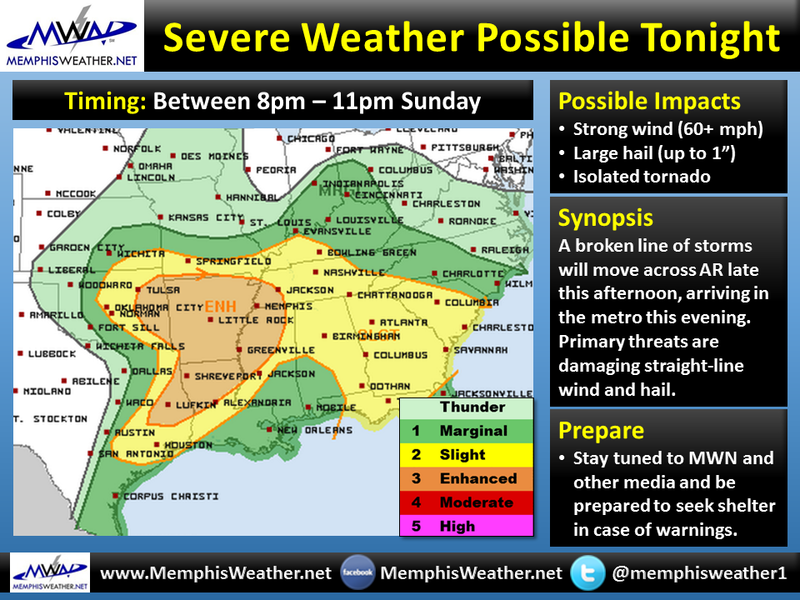 The Storm Prediction Center outlines a 15% risk area for Sunday that includes the metro. This is roughly equivalent to a Slight Risk zone. Finally, by early next week we'll dry out a bit on Monday and Tuesday with long-range models indicating a cooler pattern in store as we head towards the end of April. NOAA's 6-10 Day outlook valid April 22-26 indicates a higher chance of below normal temps than above normal temps. April showers - and a lot of them! What a glorious spring weekend we just experienced in the metro! A good deal of sun, cool mornings, warm afternoons... oh yeah, and lots of pollen (bless you!). The pollen won't have much time to build up this week as the overall weather pattern looks very unsettled with multiple opportunities for rain and some thunder. Fortunately, severe weather doesn't appear to be a big concern. A cold front is passing through the Mid-South this evening and will stall out just to our south. In the meantime, upper level systems and their attendant surface lows will track through a very moist atmosphere, triggering periods of rainfall. First, tonight, the cold front and an upper level system will move through bringing rain and embedded thunderstorms. Some of the rain will be heavy, with precipitation totals of 1-2" possible across the metro. Frontal positions and rain chances around midnight tonight. A cold front will be just to our south with rain ending overnight. Precipitable water values, which shows the amount of available moisture in the atmosphere, are near 2" in the Memphis area this evening, which is anomalously high for this time of year. This indicates the possibility of heavy rain with tonight's rainmaker. Graphic courtesy WxBell. Later tonight, that front will stall to the south and remain there through tomorrow. With no major upper level systems moving through, rain chances will be slim as a northeast breeze brings in slightly drier air. A weak system will travel along the front on Wednesday. Depending on exactly where that front sits, we could see enhanced rain chances again Wednesday into Wednesday night, though there is some disagreement in the models about exactly how high those chances are. For now, we have 40-50% chances of rain. Another lull might occur Thursday with slightly reduced rain chances once again, but then it appears that we get back into a wet pattern to end the week and start the weekend. A large upper level low pressure system is forecast to move out of the western U.S. and across our area. Again, there is disagreement in the models on how fast it does so and what the ramifications are, but there is sufficient evidence to believe that Friday could be another wet day and that the entire system may not move out until late in the weekend. Thus we remain in an "unsettled" pattern for the better part of the coming week. 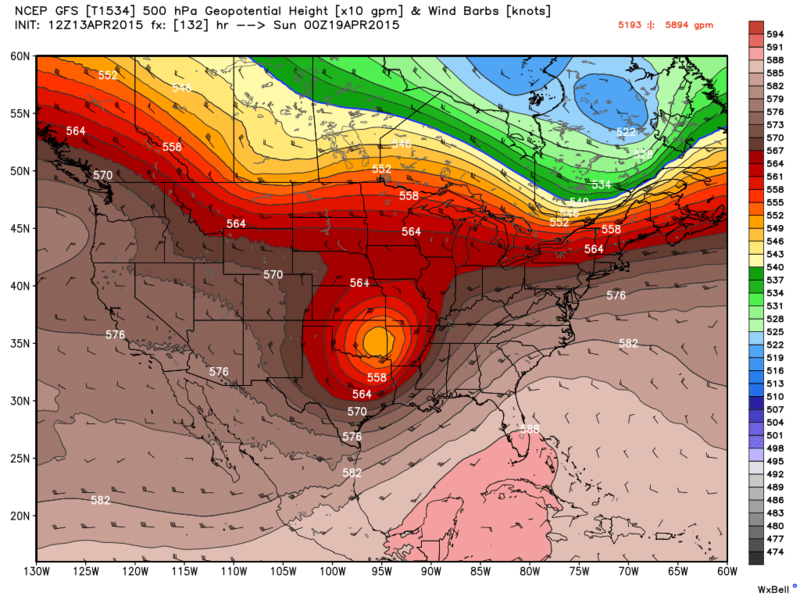 A large "bowling ball" upper level low pressure system is forecast to be over the southern Plains by Saturday evening, according to this morning's GFS model. Once this upper low moves through, our rain chances should diminish considerably. Models vary on how long that takes though. Graphic courtesy WxBell. A word to the wise on this week's forecast: the timing, track, and strength of the features that will bring our rain chances are hard to pick out more than about 48 hours in advance, even though the general pattern is fairly well understood. Rain chances 3-5 or more days out likely WILL change. We invite you to check the MWN Forecast regularly as anything past about 2 days is fairly low confidence at this point. What we do know is that when all is said and done, we will have gotten a fair amount of rain by the end of the weekend ahead, perhaps as much as 3-5". Flash Flood Watches may be needed for later in the week if a system looks like a particularly heavy rainmaker and early week systems have saturated the ground and caused streams and creeks to rise. On the bright side, the pollen should get washed away multiple times this week! 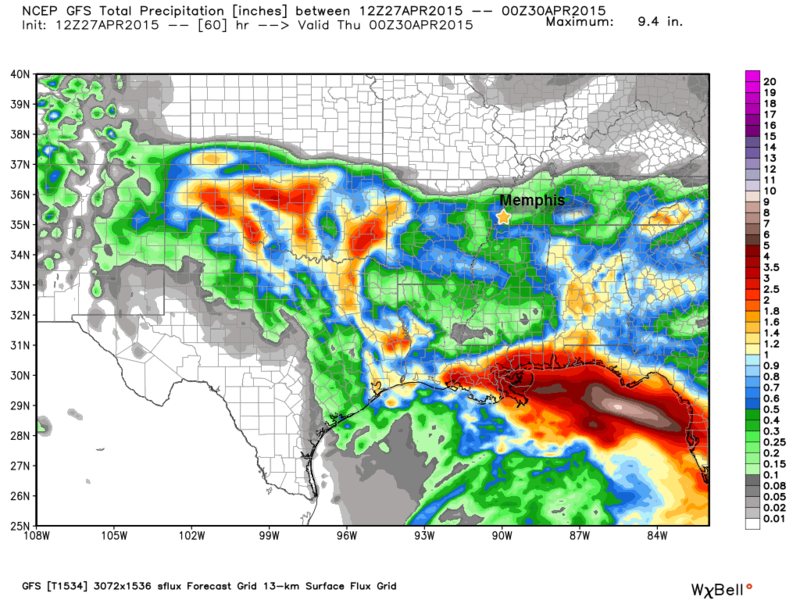 Forecast rainfall amounts over the next 7 days are significant for areas south of the Ohio River to the Gulf Coast. NOAA predicts as much as 3-5" in the Mid-South by next Monday. As temperatures climb into the lower and mid 80s this afternoon, southerly wind continues to push moist, unstable Gulf air across the area. This pattern will continue right through tomorrow, priming the pump ahead of a strong spring cold front that is expected Thursday evening. Dry weather is expected through the overnight hours tonight before we start to see a small chance of showers Thursday morning. That chance of showers becomes a chance of thunderstorms in the afternoon, but these will be scattered at best and likely not severe. By evening, we'll be watching as storms over AR increase in intensity as a cold front moves across the state. The storms should merge and develop into a squall line just ahead of the cold front before arriving in the metro. According to this morning's GFS model, the cold front is nearly overhead at 1am Friday with a large area of thunderstorms accompanying it. Graphic courtesy WxBell Analytics. 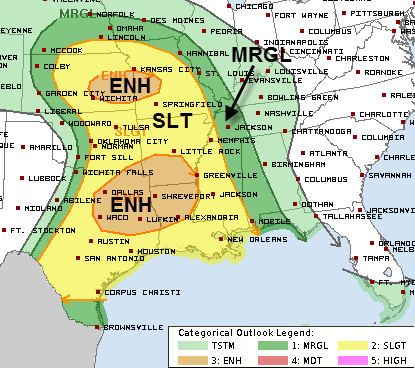 The Storm Prediction Center has placed a huge area from the southern Great Lakes into the Mississippi and Ohio River Valleys and the Southern Plains in an Enhanced risk (category 3 of 5) of severe weather with a 45% chance of severe weather within 25 miles of any given location. While timing of storms is not certain, it appears the most likely impact from the line moving through will be between 9pm-2am Thursday night. The main hazards will be strong to damaging straight-line wind, small hail, lightning, and torrential rain that could cause some flash flooding. An isolated tornado could spin up in the squall line, but the chances are fairly low and typically these types of tornadoes are weak and short-lived. We can't rule out the chance though. 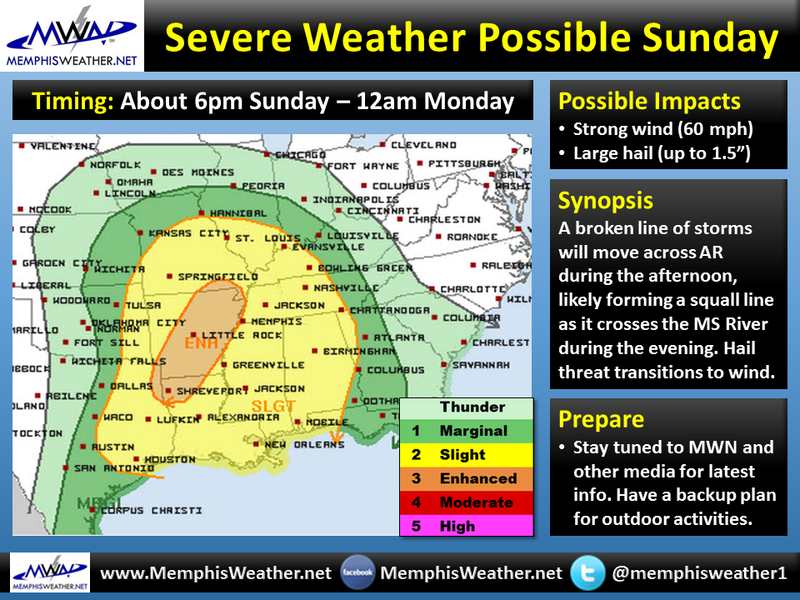 We encourage you to plan ahead, starting today, for the severe weather risk. Know where you will be, which can guide your planning. With a good chance of strong wind, secure outdoor objects that could take flight, plan to garage your vehicles if possible to protect from hail and wind-blown objects, and make sure your weather radios have fresh batteries. 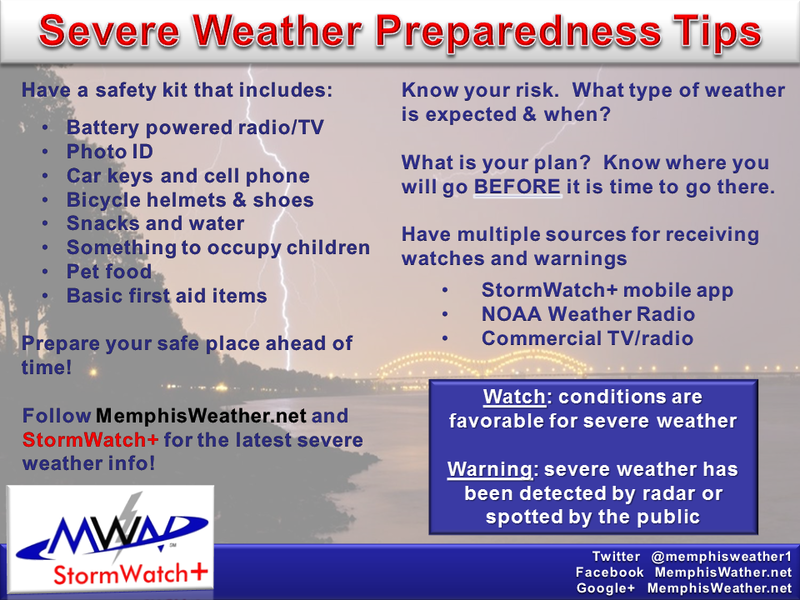 It's also a good idea to set up StormWatch+ in your MemphisWeather.net mobile app so that you will receive severe weather watches and warnings instantly if and when they are issued by the NWS. A video on how to set that up can be found here. Additional safety tips can be found below. The cold and wet pattern that started mid-February continued into early March with well below normal temperatures and one more significant winter weather event. 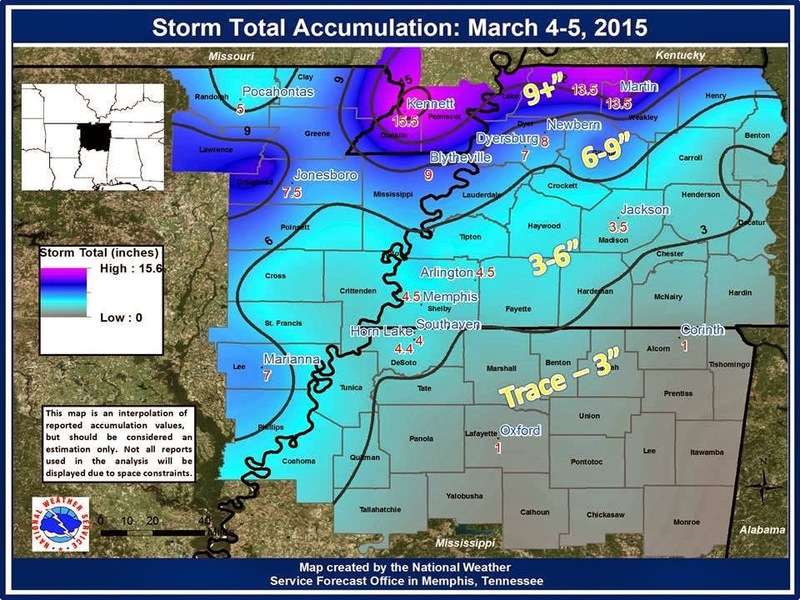 On March 4-5, a widespread accumulating event brought 3-6" of snow and sleet metro-wide, including 3.6" at Memphis International Airport. 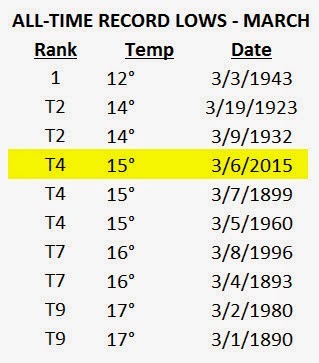 In addition, a low of 15° on March 6 was the 4th coldest March reading on record. The middle half of the month finally featured some warmer weather, but the month ended with another trace of snowfall on the 28th and more cold temperatures. There was no severe weather and even no thunder in March, which is highly unusual for Memphis. Slightly above average precipitation ended lingering drought conditions from the winter months. Records set or tied: None. Comments: A record low temperature of 15 degrees was set on March 6, breaking the previous record set 95 years ago by 5 degrees. That reading was also the 4th coldest March temperature on record. One day had a high temp below freezing and 5 days had lows below freezing (two more than average). Records set or tied: A daily record 3.1" of snow fell on March 5 and a trace of snow on March 28 tied the daily record. 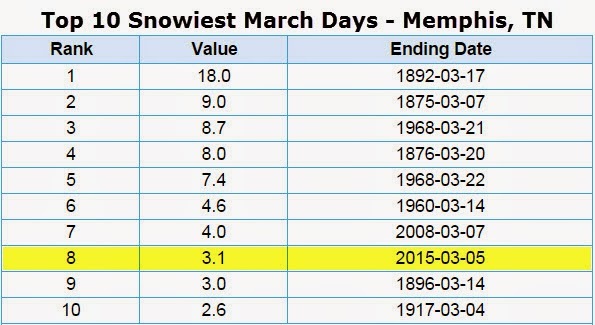 The 3.6" event total from March 4-5 ranks #8 on the list of biggest March snowfalls. Comments: Four days had precipitation above 0.50". There was no thunder reported at the airport (highly unusual for March), making this the fourth straight month with no thunder. There were two days with snow reported, one day with freezing rain, and two days with sleet. Comments: Winter precip occurred on 3 days (4th-5th, 28th) totaling 1/2" of freezing rain and sleet and 3.5" of snow. All of the measurable winter precip fell on March 4-5 (sleet/freezing rain on the 4th, changing to snow about 2am on the 5th). A trace of snow/graupel occurred on March 28. Many of you were able to get out and enjoy a cooler Easter weekend despite cloudy skies and sprinkles on Sunday, but those waiting for the next period of warm temperatures and thunderstorms, you’re wish is soon to be granted! Indeed, spring weather is quickly returning to the Mid-South and this may include a chance of strong thunderstorms before week’s end as well. The first ‘phase’ in setting up this week’s weather already moved through this morning, as scattered showers and a few thunderstorms developed and moved across the metro around daybreak this morning, in advance of a warm front lifting north through the region. While these storms were not severe, some areas did receive a quarter inch or so of rainfall, and perhaps a few of you got a slightly early wake-up call thanks to thunder! That system has exited to the northeast, leaving behind mostly cloudy skies and warming temperatures. Before getting to the potential strong thunderstorms later this week, in the interim, the weather pattern over the Mid-South should be relatively quiet. The main story for Tuesday and Wednesday will be the return of above-average temperatures, as highs reach the lower 80s. 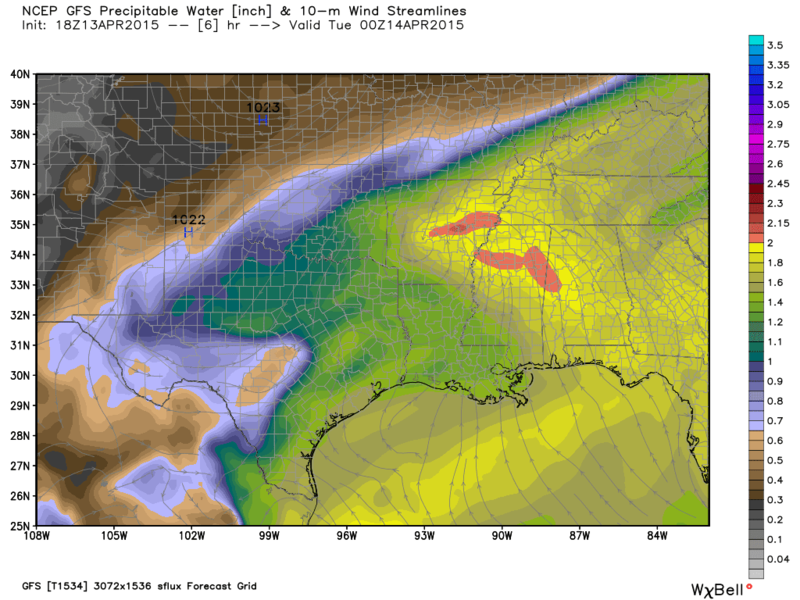 The Mid-South will be increasingly situated in a “warm sector” atmosphere, which means higher moisture levels, instability, and breezy south winds to accompany those warm temperatures. During this period, it appears rain chances should be relatively low. However, with the amount of moisture and unstable air present, and a few weak upper-level disturbances moving nearby in the upper-level wind flow, a few showers or a stray storm can't be ruled out. The threat for organized storms should stay north and west of the metro through at least Thursday afternoon. 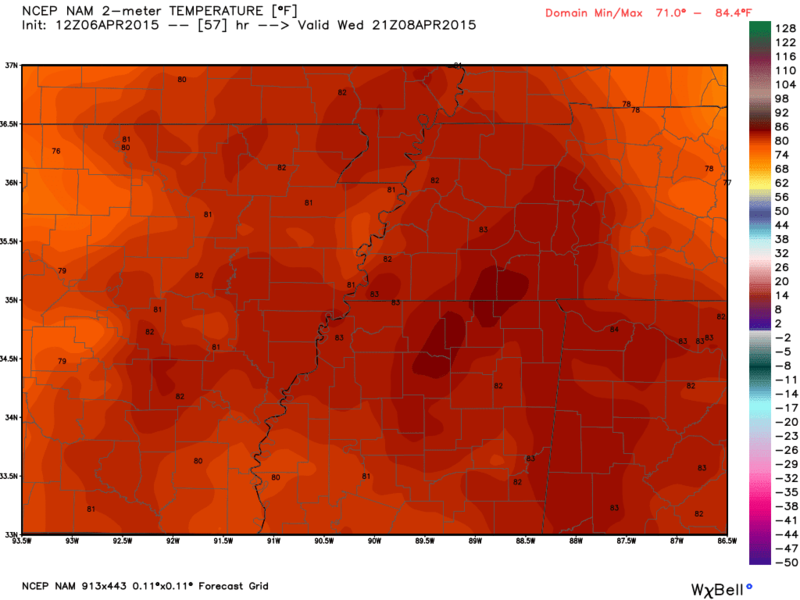 NAM forecast of temperatures at 4 pm on Wednesday, April 8. Highs in the lower 80s are expected both Tuesday and Wednesday in the metro, with only slight shower and thunderstorm chances. On Thursday afternoon, things will begin to change, as a strong low pressure system moves northeast out of the Plains states into the Upper Midwest, with a cold front trailing the low and approaching the western border of Arkansas near lunchtime. Thunderstorms should develop and organize along and ahead of the front within the established unstable airmass and move toward the Mid-South region by Thursday evening and night. There remains some uncertainty on the exact timing of when the metro might be affected by the strongest storms, as models continue to show a bit of disagreement on the speed of the front. 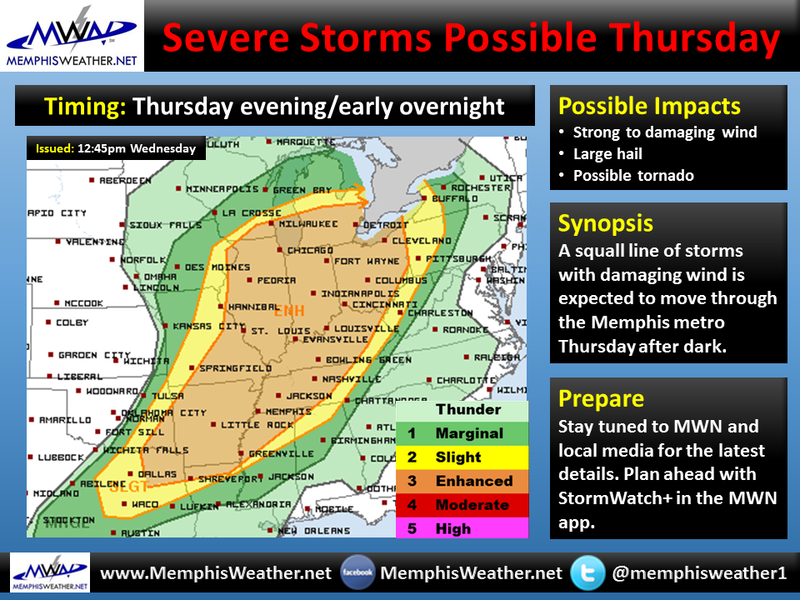 Nevertheless, thunderstorms should become likely by some point Thursday night. Precipitation forecast from the GFS model between 7 pm Thursday and 1 am Friday, indicating likely widespread showers and thunderstorms nearby/in the metro area. 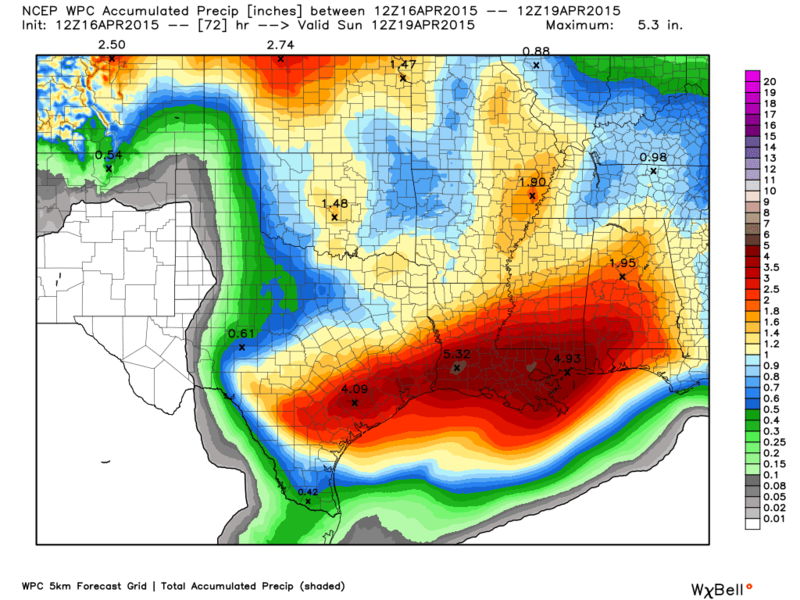 Heavy rainfall amounts (1" or greater) possible. Graphic courtesy WxBell. 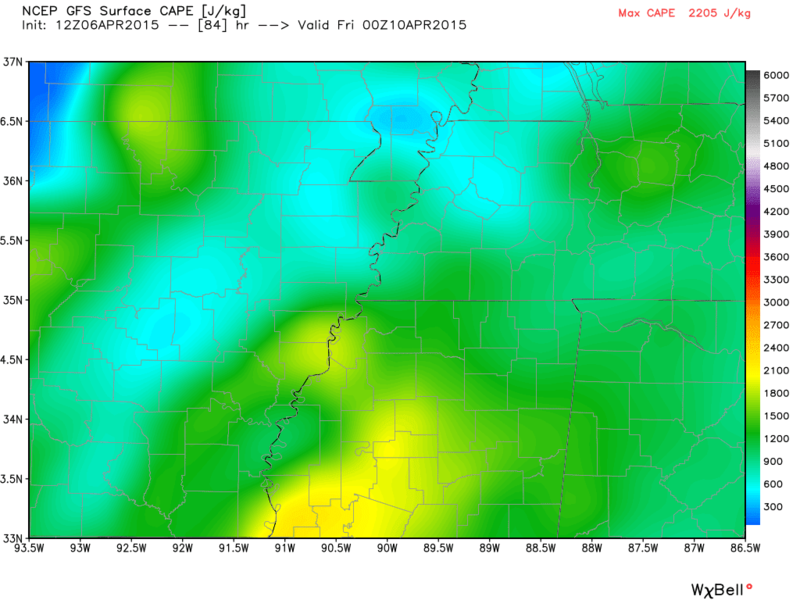 GFS model forecast of CAPE, which is a measure of instability, for Thursday evening. Values of 1000-2000 in the metro support the potential for strong thunderstorms. Graphic courtesy WxBell. With a decent amount of instability in place, aided by relatively strong winds aloft, thunderstorms that move into the region may be strong to severe in nature. Currently, the Storm Prediction Center (SPC) has the entire metro in a 15% risk area for severe weather (equivalent to a Slight Risk, category 2 out of 5) on its Day 4 outlook issued earlier this morning. Damaging wind is likely to be the primary hazard, but hail and some tornado risk cannot be discounted yet either. Early indications from the SPC show the highest tornado risk might be north of the metro, toward Missouri and Illinois, closer to the primary low pressure center (30% region in graphic below). Thunderstorms are also likely to contain a large amount of rainfall, so a risk of localized flash flooding may exist as well. 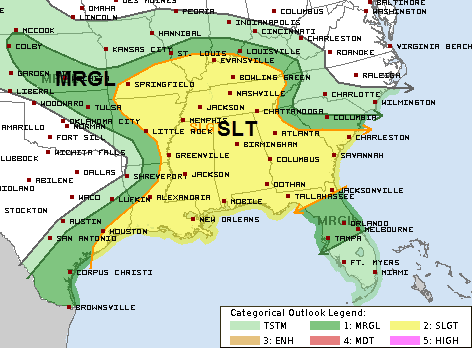 Severe weather risk outline valid for Thursday, April 9 via Storm Prediction Center. The metro area is within the 15%/Slight Risk (Category 2) area. It appears the front should push through the region with relative ease by early Friday, which would mean drying conditions and slightly cooler temperatures into the early part of the weekend. However, that might be short lived as another active pattern looks to develop by next Sunday, which may persist into much of next week. We’ll be looking closer into those possibilities in the days ahead and after Thursday’s event passes! Of course, you’ll want to stay with MWN via our social media channels listed below in the upcoming days as we’ll have more updates on severe weather chances as the event draws closer. Now is also a good time to download the MWN mobile app and add StormWatch+ within the app for instant watches and warnings during severe weather. These push notification-based alerts will only sound for the location(s) that are of interest to you and for the alert types that you select, at the times you want them. MWN is the only LOCAL source of weather information that provides this life-saving service. Links are provided below for more information or to download. 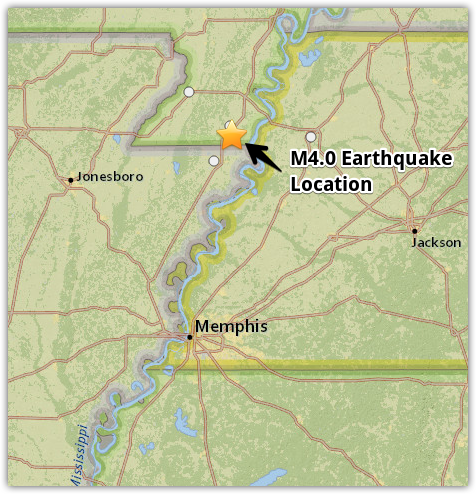 April Fool's went out with a bang, or perhaps a rumble, yesterday as the New Madrid Fault Zone briefly reminded Mid-Southerners of its presence. A magnitude 3.6 earthquake occurred in the far southern Missouri Bootheel at 10:52pm last night. Yes Kristen it did! 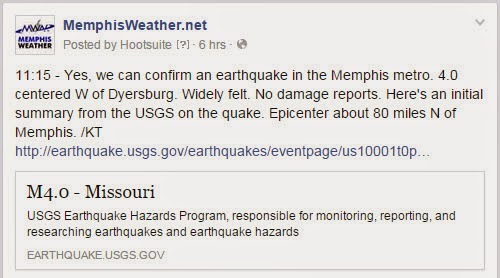 From social media reports and reaction to our posts on Facebook and Twitter, there were lots of folks that felt the tremor in the Memphis metro. 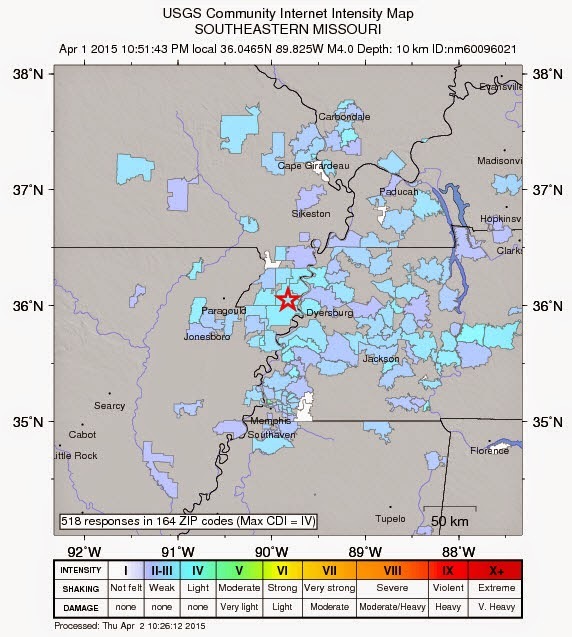 Here's the quake page for this event from the USGS, which indicates that it occurred at 10:51:43pm on April 1 4km (2mi) S of Steele, Missouri (or about 80 miles north of Memphis) at a depth of 10.9km. There appear to be no initial reports of damage. The New Madrid seismic zone of southeast Missouri and adjacent States is the most seismically active in North America east of the Rockies, according to the USGS and an unconfirmed report indicates that this was the strongest quake east of the Rockies since February 5, 2014. The "Did You Feel It?" map from USGS indicates a lot of folks did! So, did YOU feel it? As an aside, HUGE thanks to MWN intern Kevin Terry who was all over this event as it occurred lat night and got the info out quickly on our social media accounts. Admittedly, I slept through it... another great example why #TeamMWN is the best around!